There are 36 double-sided wooden tiles for the toddler to flip. The flipping satisfies a child's curiosity of what's on the other side of a tile.Each of the first 26 tiles is painted with an uppercase alphabet and on the other side a picture and the word for that picture. The word is chosen to starts with that alphabet. Each of the rest of the 10 tiles is painted with a number and the spelled word of that number. 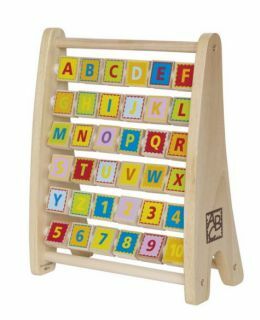 With knowing it the flipping, a child is pairing up an alphabet to a first word and a number to its written word. Tile size: 3.3 x 3.3 x 1.3 cm or 1.31 x 1.31 x 0.5"
Abacus size: 12.6" x 4.72" x 10.04"